The owner has a single point of responsibility — and is no longer “stuck in the middle” between consultants and contractors not on the same page. Owners are guaranteed the level of performance required by the RFP, and errors are addressed in a collaborative team effort, potentially eliminating the need for change orders. The owner can also choose their preferred level of involvement, opting to be fully integrated with the team, or occasionally checking in with the single contact point. It allows for earlier cost certainty because the level of cost and performance are fixed in the contract early in the process. Further, it’s the only delivery system where construction subcontractors can be selected and engaged prior to the completion of construction documents. With these resources on board, the D-B team can work together to manage cost and provide the highest-value solutions for the target budget. It can be the fastest. Like CM/GC delivery, design-build offers the opportunity to achieve schedule efficiencies through early involvement by the contractor, but it also wraps in subcontractors and suppliers. The complete team can efficiently craft solutions together, with contractor input on overall project sequencing and constructability, which means a quicker path to pinpointing the final solution. Creativity and collaboration thrive. Working together as a unified group to achieve the stated performance requirements, the D-B team has freedom and motivation to pursue creative problem-solving ideas. The entire team is more likely to feel a sense of commitment and excitement from earlier in the process. Because everyone is on the same page, and knows exactly who is doing what, the team has a higher chance of providing recommendations that meet owner needs for design, cost, and schedule. Achieving these potential design-build delivery benefits require effort on everyone’s part. Following best practices, as outlined by the Design-Build Institute of America, is a place to start. These include education and training in D-B delivery and early establishment of project communication processes. But the most important predictor of project value is trust among project team members and shared expectations for success. 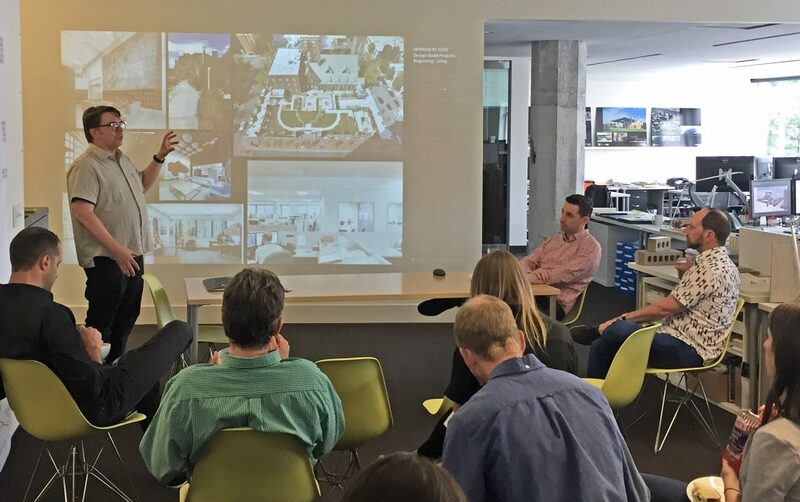 A design-build team that is a fully engaged, collaborative, and responsible — where all members have confidence in each other — has the greatest opportunity of delivering a project of which all are proud. Questions about design-build or progressive design-build? Contact Jon McGrew, DBIA.